Anybody who's needed emergency power knows you can't cut corners when it comes to generator systems. Whether you're looking for supplemental power, supplying a job site, or an emergency backup, Colorado Standby provides you with the generators you need for prime performance. Cummins is the industry leader when it comes to uptime, rock-solid reliability, and enterprise-level performance. 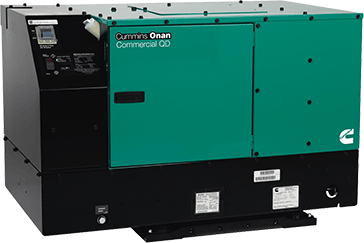 Cummins Onan generators are specially designed for the toughest jobs: first responders, disaster relief, heavy utility fleets, and a wide variety of industry applications look to Cummins Onan generators for rugged dependability. Cummins' field-tested models feature both on-board and remote diagnostics and control, minimal noise, low vibration, high output, and peace of mind backed by Cummins' global support network. Cummins is a global leader in the power generator industry for a reason; backed by nearly a century of cutting-edge engineering, responsible community citizenship, and the trust of enterprises worldwide. Cummins Onan commercial gas, LP, and diesel generators and Cummins portable generators provide unmatched quality, and our Colorado Standby technicians are specially trained in the installation, maintenance, and service of Cummins generators, the most trusted equipment systems. Going camping? Check out our RV generators for sale! Anybody who's needed emergency power knows you can't cut corners when it comes to generator systems. Whether you're looking for supplemental power, supplying a job site, or an emergency backup, Colorado Standby provides you with the generators you need for prime performance. Cummins is the industry leader when it comes to uptime, rock-solid reliability, and enterprise-level performance. Cummins Onan generators are specially designed for the toughest jobs: first responders, disaster relief, heavy utility fleets, and a wide variety of industry applications look to Cummins Onan for rugged dependability. Cummins' field-tested models feature both on-board and remote diagnostics and control, minimal noise, low vibration, high output, and peace of mind backed by Cummins' global support network. Cummins is a global leader in the power generator industry for a reason; backed by nearly a century of cutting-edge engineering, responsible community citizenship, and the trust of enterprises worldwide. If you're looking for a gas generator for sale, Cummins Onan commercial gas, LP, and diesel generators provide unmatched quality, and our Colorado Standby technicians are specially trained in the installation, maintenance, and service of Cummins equipment, the most trusted generator systems. Colorado Standby is a proud distributor of Cummins Onan commercial mobile generators servicing the greater Colorado Springs area since 1999. Our team of professionals Colorado Standby are experts in proper selection, installation, and maintenance of Cummins mobile products, providing local service and personal guidance to our customers. We pride ourselves on trust, integrity, and offering the highest standard of product quality and customer service. Our team is on standby to assist with generator sizing and specification, site evaluation, permits, electrical and/or gas installation, warranty testing, repair, and long-term maintenance; Colorado Standby offers a one-stop-shop for turn-key residential and light commercial installations, backed by over 14 years of service in the industry. With our knowledgeable team of generator technicians, electrical engineers, and certified master electrician, you need only deal with one company for comprehensive, safe, and reliable emergency backup equipment. If you'd like to learn more about our proven products, free shipping, or unmatched customer service, contact us at Colorado Standby. When the power goes out, a gas-powered generator is a dependable way to protect your home or business by providing a consistent source of immediate power. A generator powers up automatically within seconds when it senses a power interruption. Knowing your property and possessions are protected in the event of a power loss can bring you peace of mind all year round. Gas generators are a reliable way to provide an extra level of protection all year round, whether your area is prone to storms that cause power outages or not. Both homeowners and business owners rely on the power of a standby generator to keep them safe during inclement weather that can cause an outage, and especially in areas of the country that experience regular severe weather events such as hurricanes. However, construction and road projects can also cause a loss of power, no matter where you live. A standby gas-powered generator will keep your power on whenever an unexpected power loss occurs, regardless of the cause. Colorado Standby offers the largest inventory ofgas generators for sale available. We offer fast, free shipping, and can handle the installation, setup, initial operation, service, and maintenance of your generator as well. When the power goes out unexpectedly, a diesel generator can help protect your personal safety, your property, your loved ones, and your employees by providing instant power to your home or business. A generator powers up automatically within seconds of a power loss and can bring you peace of mind all year round, knowing that your property, whether it’s your home or business, is always protected. Diesel generators are a great way to provide an extra level of protection you can depend on no matter what the season is or whether your area is prone to storms that cause power outages. Homeowners and business owners use the power of a standby diesel generator to keep them safe during inclement weather that can cause an outage, but construction and road projects can also cause a loss of power even when the skies are clear. A standby diesel generator keeps your power on and your business open whenever an unexpected power loss occurs. Colorado Standby has the largest inventory of diesel generators for sale available. We offer fast, free shipping, and can handle the installation, setup, initial operation, service, and maintenance of your generator, so the power you need is always available. If you want an Onan diesel generator, look no further! Colorado Standby has one of the best selections of Onan Generators. Take advantage of our fast and free shipping today.